Applying for a merchant account can be tedious – especially if you are a high-risk merchant. After all the paperwork is gathered, applications signed and underwriting completed, you receive an approval for your new payment processing account (YAY! ), but it comes with stipulations. One being a merchant account reserve, and the questions start popping up. Are the fund held indefinitely? Why was one required on my account and not my associates in the same industry? Is there anything I can do to remove the merchant account reserve? These are all valid queries, and it’s important to know the answers to all before agreeing to the terms. Let’s break down merchant account reserves so you can feel educated should you ever come across this prerequisite in a payment processing approval. Simply stated, a merchant account reserve is an amount of funds set aside and held by your acquiring bank. An acquiring bank is the entity underwriting your company for the acceptance of credit, debit and/or ACH payments. Think of it as a non-interest-bearing escrow account. The monies lessen the risk for the bank and protect against unforeseen losses. If your business is unable to financially cover unpredictable mishaps – we’re talking business closure, fraud, chargebacks – your payment processor is responsible for ensuring they are satisfied. The merchant account reserve funds the incurred losses and safeguards you from coming up with the dollars out of pocket. 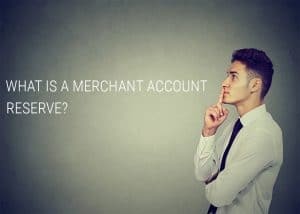 Now that we understand what in the heck a merchant account reserve is, let’s discuss the types of reserves you may see. Which of the below three you are subject to depends on the underwriting criteria of your acquiring bank. A rolling reserve takes a portion of each transaction processed and places the funds in the merchant account reserve. The percentage of the transaction withheld varies for each merchant, but 5%-15% is typical. The funds are released at a later point in time, usually 6 to 12 months. The oldest funds are released first after the determined time-held period passes. As the name states, an up-front reserve means the bank requires a set dollar amount to be funded before a merchant is allowed to process payments. Furthermore, the amount of the reserve typically centers around the merchant’s monthly processing volume. Most often merchants send the monies requested directly to the bank. It can also be agreed upon that all payment processed are held until the merchant account reserve is fully funded. Similar to a rolling reserve, an accrual reserve holds a predetermined percentage of each payment transaction until the reserve amount is available. After that point in time, the acquiring bank no longer deducts a percentage of the payment. Finally, funds are held indefinitely in this scenario and not released on a consistent basis. Hopefully you have a better understanding of a merchant reserve– now what? Good news is with consistent processing history and low chargeback ratios; you can ask your acquiring bank to reassess your account within 6-12 months. In most cases, if the bank sees a reduced risk for the foreseeable future, they will lift the reserve requirement. Partnering with a payment processor that can guide you through the steps and answer all your questions is imperative to your merchant success. At Payment Savvy, we have extensive experience with high-risk merchants and will work with you to ensure we are presenting your application in the best possible light. We’d love to learn more about your payment needs and discuss our innovative solutions. Please don’t hesitate to reach out if we can be of assistance – our Savvy Squad looks forward to hearing from you. We hope you enjoyed this article, be sure to follow us on LinkedIn, Facebook, or Twitter to see all our latest postings!